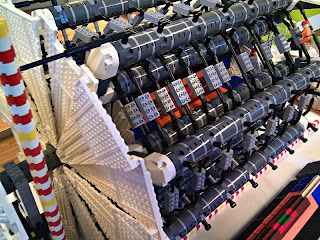 A Lego model of the huge ATLAS detector at CERN has been built by Sascha Mehlhase. The model itself is intricate and took a lot of work to design and build. ATLAS has been in the news recently. It's a huge particle detector at the European particle physics lab CERN on the Swiss/French border. It's been in the news because it has found encouraging evidence for the Higgs boson, a much sought-after fundamental particle predicted by the leading theory of particle physics, the Standard Model. That model stands or falls on the existence or absence of the Higgs. The detection of the Higgs is fundamental in every sense of the word, but it is not yet secure. The evidence from ATLAS is not yet adequate - a strong hint rather than a definite find. But ATLAS will collect more data next year and that should be enough to decide for sure. The Large Hadron Collider (LHC) is a vast machine and ATLAS (just one of the LHC's detectors) is itself a very large and expensive multi-storey construction. Sascha Mehlhase has built a model of Atlas entirely of Lego bricks, quite an achievement in itself. The design and construction took more than eighty hours work and contains nearly ten thousand bricks.